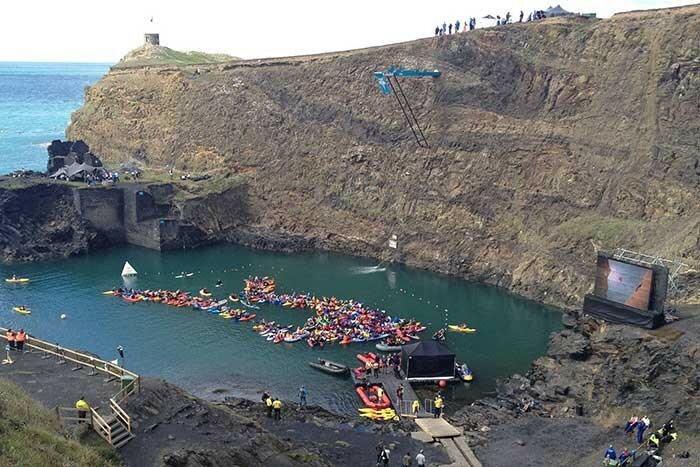 With competitors diving from a height of 27 metres from the top of the Pembrokeshire cliffs, XL Events needed to ensure that spectators in both of the cliff viewing areas had an excellent view of the 14 divers from nine different countries. 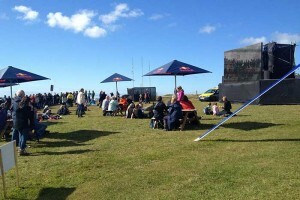 To achieve this, XL Events installed two Lighthouse R7 LED screens, one at the top and one at the bottom of the cliffs, and each measuring 5 x 3 metres. XL selected the R7 screen for this outdoor project as it is weatherproof, robust and its high brightness and shaders make it the perfect choice for use in sunlight. The screens were installed by Sandro Bruni and Jan van Geet, who also operated cameras during the two-day event. The content for the screens was provided by two of XL Events’ HD cameras – one Sony HXC-100, and one HDC 3300 super slo-mo camera to show the divers’ intricate turns in the action replays. Replays were controlled by an EVS S-LSM XT2 live HD production server managed by Jonathan Camacho. The screens also took feeds from Red Bull’s own Sony cameras and a Polecam located above the divers platform, capturing amazing overhead aerial shots. To process the footage as it happened, XL Events provided a Grass Valley Kayak portable production unit to produce the location content, with VT playback via two Grass Valley Turbo 2s and screen graphics on two PowerPoint laptops. XL’s crew for the PPU, graphics and VT were Mark Cranham and Charlie Archer. XL Events also supplied Panasonic 47" LCD screens for monitoring. These not only provided the commentators with a live view of the diving and action replays but also allowed the competitors to follow their rivals’ progress. Red Bull’s vision director for the event was Kevin Watts and project manager for XL Events was Phil Smith, who comments: "Working in such a unique environment presented many health and safety, logistical and rigging challenges, however the hard work and dedication of all the crew ensured XL once again delivered. It was a pleasure to work alongside the Red Bull team to help create a very successful event in a stunning setting." 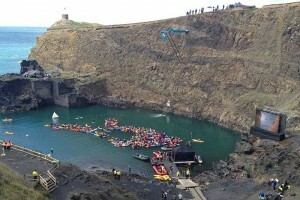 The winner of the UK leg of the Red Bull Cliff Diving World Series was Brit, Gary Hunt, who leads the standings going into the final two rounds in Brazil and Thailand.